WEDNESDAY, Sept. 10, 2014 (HealthDay News) -- A few extra pounds might do more than test the strength of that belt around your waist, a small study suggests: You could also boost your blood pressure slightly, even if you gain just 5 percent of your body weight. For the study, researchers told 16 people to consume an extra 400 to 1,000 calories a day for eight weeks. Their blood pressure levels rose a bit on average, although not to an unhealthy range. But people who put on weight in the abdomen appeared to be at special risk of seeing their blood pressure rise, said study lead author Naima Covassin, a research fellow with the Mayo Clinic in Rochester, Minn. While it's not clear how the changes could affect cardiovascular health, Covassin noted that "this is the kind of weight gain that occurs over the holiday season, or on a cruise, or in college freshman year." Researchers and physicians already know there's a link between excess weight and higher blood pressure, which in turn boosts the risk of heart-related problems. But it's not clear why weight affects blood pressure, so the new study aimed to gain a greater understanding of that connection. The 16 people in the study ranged in ages between 18 and 48, and boosted their weight by consuming ice cream shakes, chocolate bars or energy drinks. The goal was to add 5 percent of their body weight -- which would be 10 extra pounds on a 200-pound frame. The participants were not obese when the study began, although they could be overweight. 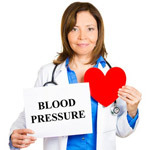 At the end of the test period, the systolic blood pressure -- the higher number in a reading-- of the participants was taken over a 24-hour period and compared to those from a group that had not gained weight over the same time frame. Greater blood pressure increases were seen for those who added the weight inside their abdomen. However, blood sugar, insulin and cholesterol levels in the weight gainers didn't change. So will all types of weight gain boost blood pressure? Probably not, said Donna Arnett, a past president of the American Heart Association and the chair of epidemiology at the University of Alabama at Birmingham School of Public Health. "Excess intake of foods rich in potassium like fruits and vegetables or dairy could lower blood pressure," she said. "Processed foods high in sodium could lead to greater blood pressure increases." Arnett, who called the study "innovative and novel," dismissed the idea that many people are doomed to higher blood pressure because aging and weight gain often go together. "We must maintain an intake of calories that matches caloric expenditure, and caloric expenditure decreases with age," she said. The study findings were scheduled to be presented Sept. 10 at the American Heart Association's High Blood Pressure Research Scientific Sessions in San Francisco. The research should be considered preliminary because it hasn't gone through the review process required of studies printed in major medical journals.